As the 2016 general election on Nov 6 gets closer, Mary spotlights a congregation within the POWER interfaith network that’s working hard toenhance voter engagement in its neighborhood. Now at its seven year milestone, POWER (Philadelphians Organized to Witness, Empower & Rebuild) is doing great things on a regional and statewide level. Our efforts include establishing a living wage for service workers at city facilities, responding to the effects of climate crisis on vulnerable communities and leading the charge to end to cash bail in Philadelphia for low-level offenses. But the life-blood of organizing that keeps members energized—ready to stay in the “long game” that systemic change demands—is personal and local. POWER member-congregation St. Vincent de Paul Catholic Church started its organizing experience six years ago by pressuring a new City Council member to get rid of a mountain of old tires in an empty lot near the church. Strong supporters of POWER’s major policy campaigns ever since, they are now testing their organizing skills in another way by inviting local congregations unaffiliated with community organizing—so far—to work with them on voter engagement in this critical election season. With the encouragement of parishioners, Fr. 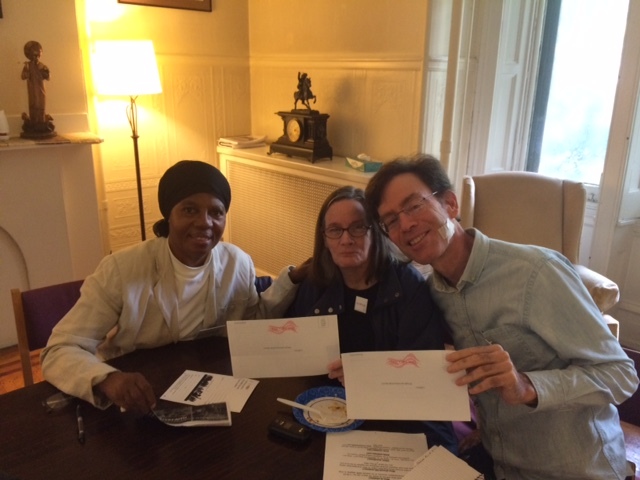 Sy Peterka wrote letters to leaders of the more than 60 houses of faith in the neighborhood inviting them to meet and discuss their shared concerns for the neighborhood, city and region, starting with a voter-outreach campaign. Still expanding, the resulting band of 7 congregations informally dubbed themselves “G.I.V.E”– Germantown Interfaith Voter Engagement. They have not wasted time getting to work. Starting in August, clergy and lay leaders have attended intensive POWER trainings, where they learned about the nuts-and-bolts of voter registration and the relationship-building potential of talking with voters about issues they care about and want to change. With the registration deadline just days away, these congregations are now acting on what they’ve learned together. Several are incorporating voter tables into their regular programs. For example, Polite Temple Baptist Church invited residents of nearby transitional housing centers to come to their balloon-festooned voter-drive open house. Some congregants will be joining St Vincent’s and other POWER congregations to talk with Germantown residents about voter turnout on Nov 6, and how to keep whoever wins accountable to the people, long after the election. With POWER, G.I.V.E. will host an active Germantown voter meeting in November, between the election and Thanksgiving. But for now, all are focused on goals they are working on together: Boost registration, turnout, and year-round voter engagement in the neighborhood where they live, work and pray. Mary is the Catholic Community Organizer for POWER.